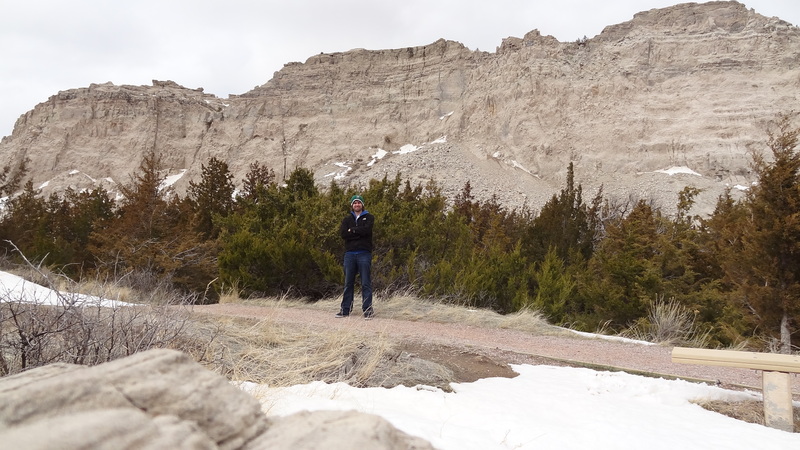 So I spent about half of last week’s epic journey to my former hometown of Billings, Montana on the road and averting the various snowstorms that have been ravaging the Midwestern states throughout the better part of April. Two of the days consisted of 1,100+ mile stretches of interstate (from the D.C. area to Minneapolis, and then back a week later). Another two days consisted of driving through South Dakota to Billings (to avoid the snow in North Dakota) and then driving back through North Dakota only to get hit with a new storm just outside of Minneapolis. Spring can be unpredictable in those parts, but I suppose the memory of last year’s winter (or lack thereof) gave me a false sense of security. What I didn’t spend doing was a lot of sightseeing of new places. The drive was mostly interstate (save for the lonely Highway 212 from Belle Fourche, South Dakota into Billings) and rather uneventful. I did pick up a few new counties, though, including the ones 212 winds through (southeastern Montana), a few in southwestern Minnesota and a couple in Wisconsin when I rerouted up to Milwaukee to avoid construction en route to Madison. I also picked up a new national park site and revisited an old one. 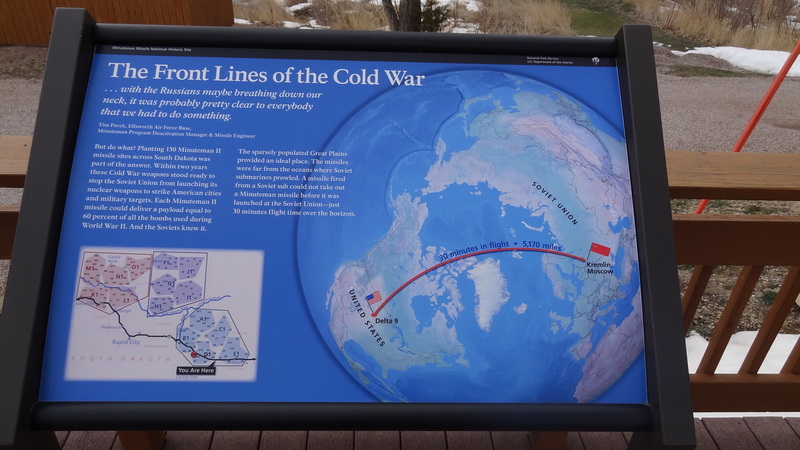 I had visited Badlands National Park in South Dakota before as a child but had just enough time to check out the northern territory of the park (located right off I-90) and the added benefit was also getting my parks passport stamped at Minuteman Missile National Historic Site – established in 1999 just outside of the Badlands entrance. It’s easy to miss, despite the signs, as it basically looks like an unassuming trailer home. Be on guard. Are these a threat in winter too? The Badlands, an eclectic collection of jagged rock popping out of the plains, are a site to behold and, like many of the major national parks, appear otherworldly (and just might be home to the otherworldly, as a recent episode of Monsters and Mysteries in America cites the Badlands area as a home of the creepy black-eyed children phenomena). 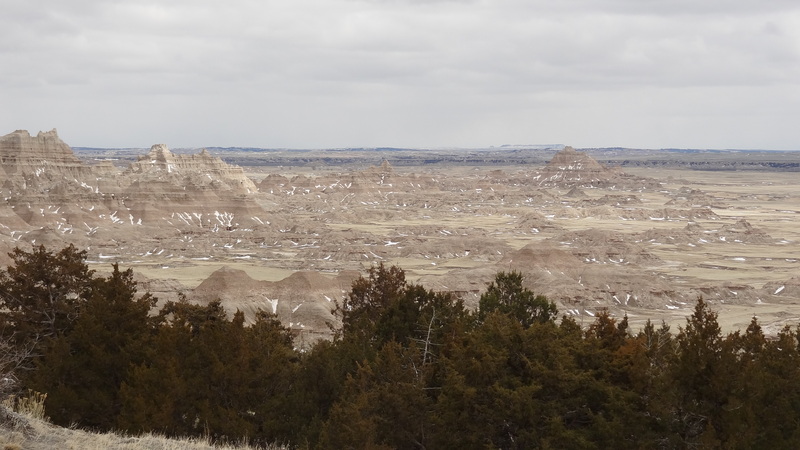 You just don’t see scenery like the Badlands offers during a typical day. 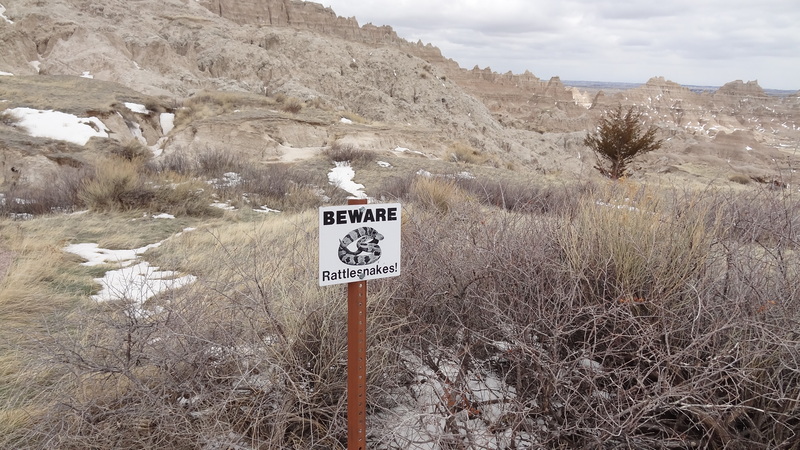 Heck, towns weren’t built around the relatively arid soils of the Badlands for that reason anyway – so the population has remained relatively sparse in interior South Dakota (by the way, Interior just so happens to be the name of the tiny town closest to the park headquarters – home to just a shade under 100 people). I felt I had the park to myself on this particular mid-April afternoon. Clouds covered most of the sky, snow was still scattered about the park and the temperature hovered at around 39 degrees. I managed a couple very short walks (a half-mile loop and another short trail to a scenic overlook) and took the five-mile drive to the visitor center. For most people, this may have not been worth the $15 entrance fee (I really should buy the annual pass for $80 at the rate I’m going), but an hour at one of America’s great parks is worth the effort in my book (heck, I paid about $100 in tolls on this trip, so $15 for a national park is the least of my complaints). The humble little Minuteman Missile NHS HQ. 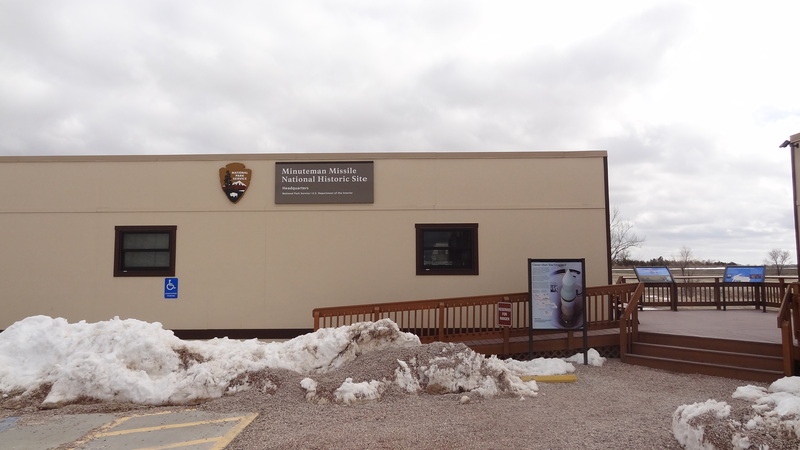 My stop at the Minuteman Missile Visitor Center was about what I expected (at least when it comes to visiting some of the “smaller” park service units, see: Paterson Great Falls NHP). Usually with these types of smaller parks, you are greeted by a NPS volunteer or non-ranger employee who has sat there most of the day just waiting for someone to walk in. Let’s just say they are ready to talk your ear off. It was no different at Minuteman, as a friendly retired Minuteman Missile operator was more than eager to speak to me about the operation. Despite my relative need to keep moving (and beat the storm coming up from Colorado into South Dakota), I happily engaged in about a 15-minute conversation with one of the friendliest guys I’ve met at an NPS site. The Minuteman Missile site preserves the Minuteman II missile, the last of it’s kind (there are still active silos carrying the Minuteman III ICBM’s). The one scheduled tour for the day had concluded, but there is a self-guided phone tour at the Delta 09 complex closer to Wall, South Dakota (about ten miles west of the HQ). I had no time for that or the movie, but happily got my stamps and read the info boards outside (and got plenty of information from the friendly volunteer). 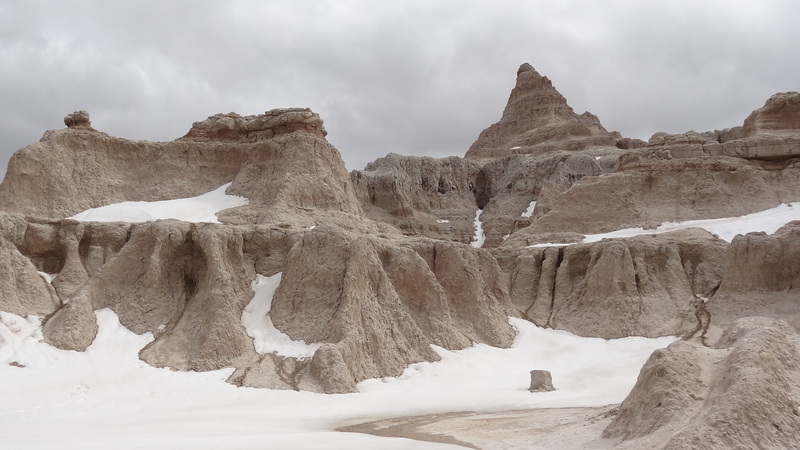 I’m hopeful I’ll return, as my girlfriend and travel partner, Breeah, no doubt will want to see the Badlands for herself (and put up with a short missile tour). 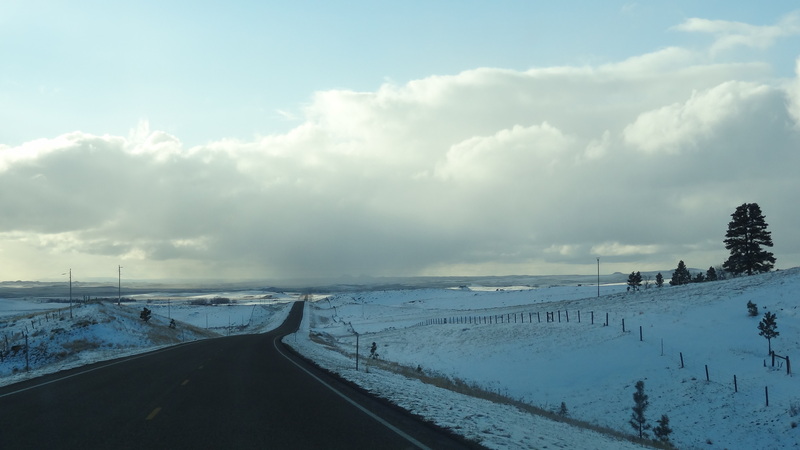 The friendly skies of Montana along Highway 212 – I made it all the way there! Breeah and I actually took some time on this trip to visit Fort Snelling State Park in Minneapolis. While we’ve often driven by the site, we’ve never looked in. Despite the chill and relatively fresh snow, people were still driving out to the park on a sunny Saturday afternoon. The park is actually within the Mississippi National River and Recreation Area, but I didn’t know this until now (or I would have checked the visitor’s center for an NPS stamp – I’ll have to get this rectified later). The relatively large near-200 year old fort was built to protect the U.S. territory from the British and Canadians. It’s closed until Memorial Day so we were just able to get a quick peek in. Further down the trail is some abandoned World War II barracks which stand eerily empty and unused (want to experience a ghostly chill? Try staring into the windows of the padlocked doors). All this is surrounded by the busy I-494 loop and the MSP International Airport – creating an odd juxtaposition of sorts. I’ll be heading back to the Minneapolis area soon and hope to track down that stamp (as well as maybe make a run for the border, as in the Wisconsin-Minnesota border and scout out the St. Croix National Scenic Riverway).